My next craft fair is less than a week away now, and I’ve stayed more or less to my target of making something to sell every day. Owls are still very popular, and an easy shape to crochet, so I improvised these cute little amigurumi keyrings. I could happily making dozens of these in all different colours, but I’ve just made a few to start with to see if they sell first. 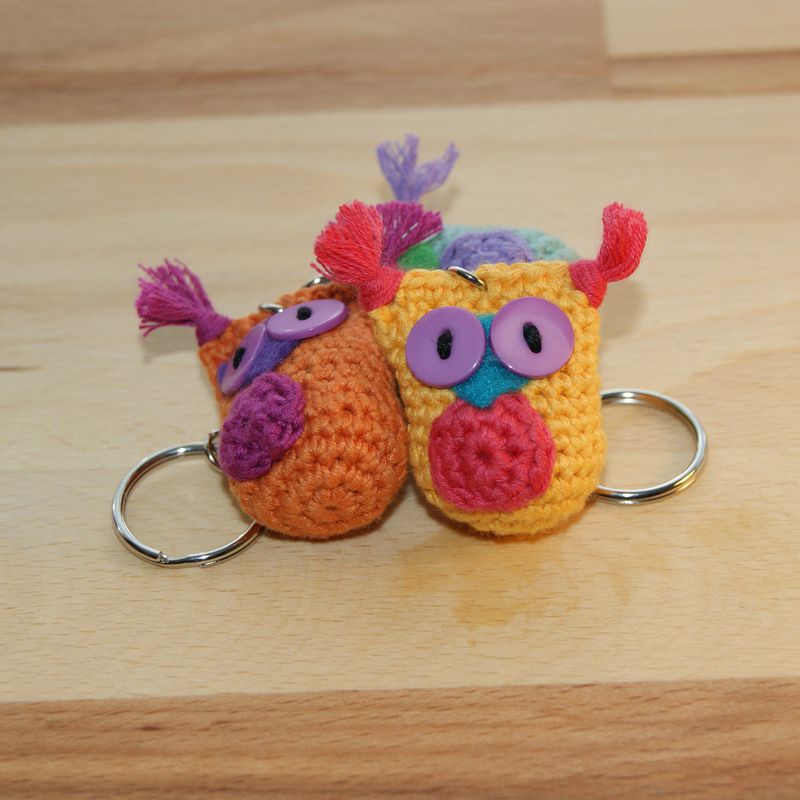 Crochet owl keyrings. Small, cute, and hard to photograph because they won’t sit up and behave! I love wool, but unfortunately wool doesn’t love me. When it comes to sensitivity I could give the Princess and the Pea a good run for her money. Everything seems to make me itch, which is bad enough when it affects what fibres I can wear next to my skin, but when itchy hands force me to put down my crochet hook I’m doubly grumpy! Thankfully there are some amazing varieties of yarn out there that don’t make me want to take a cheese grater to my hands, and my favourites are all cotton. I aim to make all 30 projects from Emma Varnam’s Crocheted Keyrings and Charms book, and these three were all worked in Drops Muskat yarn which is 100% mercerised cotton.